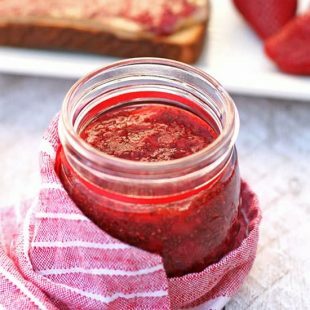 This Easy Strawberry Chia Jam is a sweet and healthy treat to top your toast. The jam only has 4 ingredients and takes less than 20 minutes to make! I used to love peanut butter and jelly sandwiches when I was a kid. I had one for lunch every day in grammar school – yes, EVERY day. To make it easier to prepare lunch, we even got that stuff that had the peanut butter and jelly in one jar (I think it was called Goober or something – let me know if you know what I’m talking about). After grade school I got sick of pb & j so I moved on to more sophisticated lunches such as french fries – no I was not the healthiest of eaters back then. I actually can’t remember having a peanut butter and jelly sandwich between 8th grade and this year… but then I made my easy strawberry chia jam and I’ve been loving pb & j sandwiches again! The idea of chia jam has been around for a while but I just started testing some of my own recipes lately. Basically, you just heat up some fruit, add a little sweetener and throw in some chia seeds – how easy is that? Traditional jam contains loads of sugar so I wanted to make a healthier version. I used a little maple syrup to sweeten the jam, but the fruit is so sweet, it didn’t need much. My easy strawberry chia jam comes packed with other nutritional benefits too! Chia seeds are high in omega-3s which help calm inflammation. They also contain fiber, protein, phosphorus, and calcium. 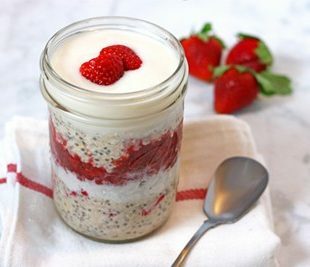 Besides sandwiches, I use this easy strawberry chia jam to top my vegan yogurt and smoothie bowls. I also use this jam to make my Strawberries & Cream Overnight Oats. This could also be a great option for kids because of the low sugar. If you have peanut allergies in the school, almond butter is another good choice – actually, that’s what I use most of the time so I should be saying “a & j sandwiches” but doesn’t have the same ring to it. 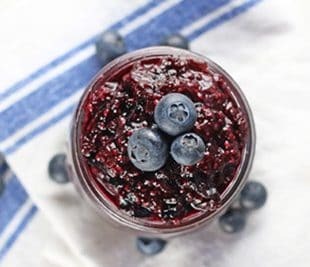 If you’re a blueberry lover, like me, check out my Blueberry Chia Jam version too! If you make this Easy Strawberry Chia Jam recipe, let me know what you think by ★ star rating it and leaving a comment below. Heat strawberries in a pan for about 5-10 mins. Mash them with a fork while they are cooking to break them up. Take the strawberries off the heat and stir in maple syrup, lemon juice, and chia seeds. Let stand until cooled and transfer to jar for storage in the refrigerator. Jam will last about 2 weeks in fridge. This strawberry jam can also be made with raspberries, just replace the same amount of strawberries with raspberries. This is the prettiest jam I have ever seen!!! It’s so pink and gorgeous. So simple too! I love that it’s only 4 ingredients. I was never into pb & j to be honest, but I love the sound of this jam! Aw, thanks so much Kimmy, you always leave the nicest comments. This looks delicious! I love chia seeds, but I have never made jam before. This looks wonderful, great color and I love the addition of chia seeds. Thanks! This is right up my alley! Sooooo good. I totally remember that one jar stuff- yuck!!!! I’m so glad someone else remembers that! It thought it was so cool when I was 7 but looking back, it was gross! I love chia jam. This is so pretty!!! Looks really easy, healthy, and delicious! I have to remember to make my own instead of buying jams! My husband is such a jam eater and always has a few jars. How long will this type of jam last? I love chia seeds but I haven’t really tried making jam with them yet. 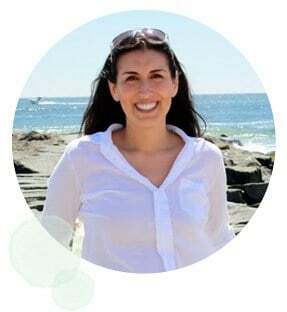 I definitely want to- so easy and so much healthier! Let me know if you try it Annmarie! I used to eat PB&J everyday in school (all the way through high school). I still crave a PB&J now, but don’t like the prepared jelly/jams because of all the added sugar, so I’ll just mash up some berries on top of my nut butter. This looks so good and easy, I’ll have to give it a go! Thanks Vicki! I’m loving the pb&j again after starting to make this. Let me know if you try it! We eat a lot of (peanut free) peanut butter and jelly (my son is allergic to nuts and peanuts!)! I love a good chia jam—so yummy! Yes, it’s such a great little treat. I’ve have the jam with raspberries too and it’s so delicious! Wow. I had no idea making jam was this easy. I’m definitely going to make this, thank you. My kids eat loads of pbj! Thanks Rachel! Yes, it’s so easy! I love it on pb&js! This jam is my jam!! It is absolutely delicious and perfect for a healthier PB&J. My kids love it. 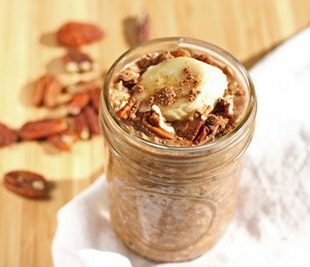 I make a batch and I love adding it to my oatmeal in the morning. Its unbelievable that something that comes together so easy could be this delicious. It is an impressive addition to your brunch spread. I make chia seed jam all the time, but I never cook my fruit. Everything in a little blender, pop in the fridge and in the morning, jam. I’ve noticed all recipes call for cooking the fruit why? I cook the fruit because I usually use frozen fruit but feel free to make the jam anyway that works for you.